Tamico´s 10th Anniversay. Let´s celebrate. With a very special model: Porsche 934 RSR Vaillant TA02SW This model, composed by us, is based on the Tamiya Black Porsche RSR Kit No. 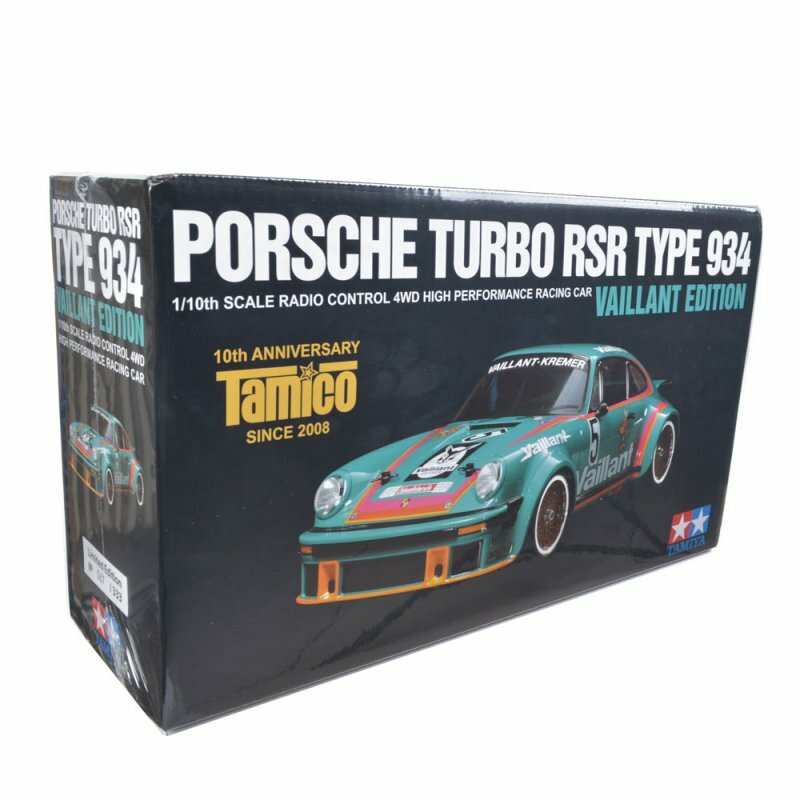 47362, but has the green attachments and the Vaillant decalset of the equally limited 30 year Tamiya RC Porsche 934 TA05 Kit 49400. The kit is numbered and strictly limited to 333 pieces. The basis for this model is the TA02SW chassis (SW stands for short / short wheelbase and wide / wide rear track) and is equipped with a variety of tuning parts. This is a 1/10 scale R/C model assembly kit. Length: 435mm, width: 202mm, height: 130mm. The evergreen form of the 934 is recreated stunningly in durable polycarbonate, with separate side mirror and wing parts. Separate light cases are also included. Comes with an LED light unit to light up headlights and taillights for the ultimate realistic appearance. The TA02SW chassis was previously used on the 911 GT2 Racing (Items 58172, 84399 and 47321). It offers a short (236mm) wheelbase and wide tread setup; similar to that so often employed by Porsche. This kit uses the FRP chassis set, which transforms the chassis into a double deck unit using rigid and lightweight FRP material parts. FRP front and rear damper stays ensure optimum performance from the CVA oil damper-fitted 4-wheel double wishbone suspension. The stainless steel propeller shaft is highly durable and offers efficient transmission of power, particularly in combination with the front and rear assembly universal shafts, which come with ball diff cup joints. Enclosed front and rear gear cases have built-in diff gears. The rear is fitted with a ball differential. Comes with 2-piece wheels, tires and inner sponges. The rear of the model uses wide wheels. This entry was posted in Future Releases on July 31, 2018 by admin.